Simon Says Use Pattern Paper. 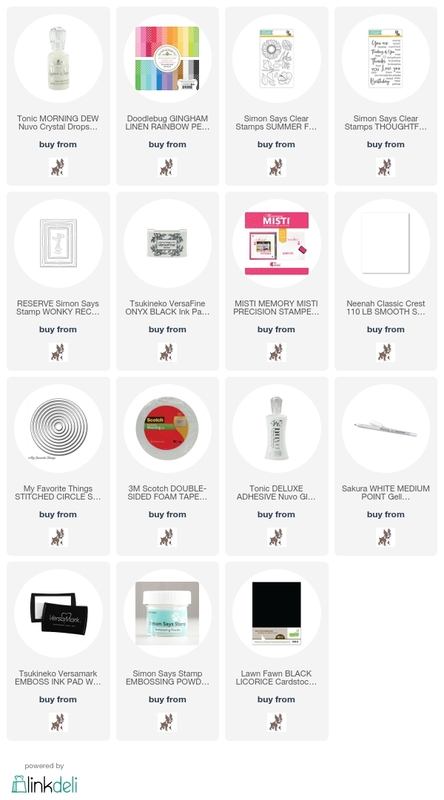 As always Simon Says Stamp will be giving away a $50 voucher to shop at the fabulous Simon Says Stamp Store. My take on the challenge here is to use paper piecing as the technique. I used Gingham Linen Rainbow Petite 6×6 pattern paper pad from DoodleBug. I used the six colours of pattern paper on my card. The neutral grey for the background panel. I used the new Simon Says Stamp Wonky Stitched Rectangle die and I die cut a circle in the middle of the panel. 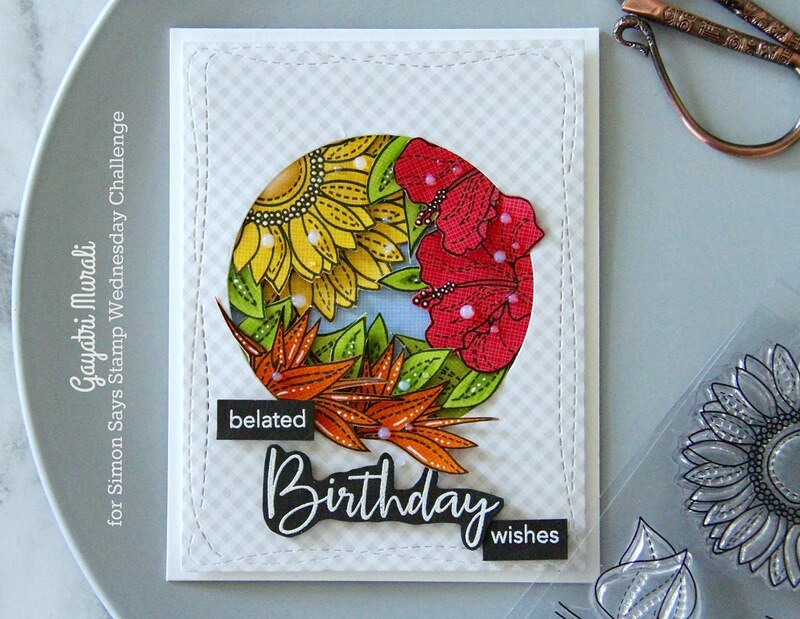 The flowers and leaves are from the new Simon Says Stamp Summer Flowers stamp set. 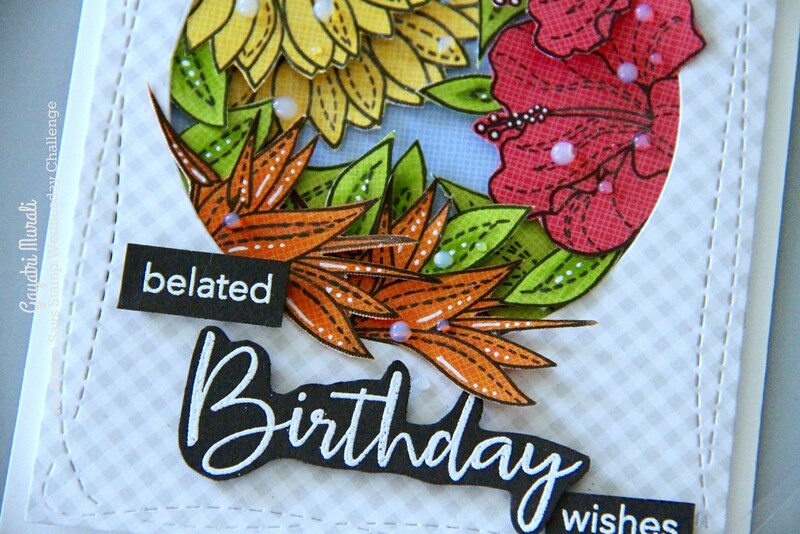 I stamped the image on yellow, green, red and orange pattern paper from the Doodlebug 6×6 paper pad. Then I hand cut them all out. On the card front, I adhered blue pattern paper with linen side facing up. Then adhered the grey gingham panel using foam adhesives. 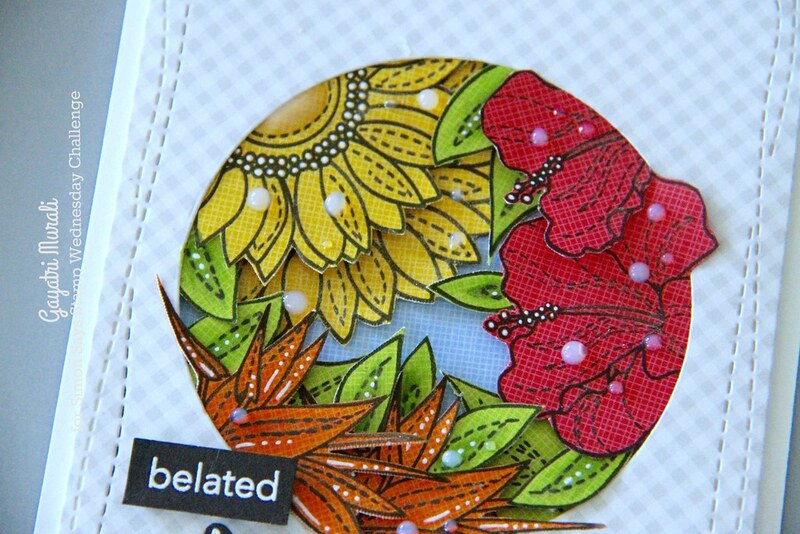 Then I tucked and adhered the flowers and leaves around the edges of the circle die cut with a few of the images overflowing out. Some of the images are adhered flush with glue and others using foam adhesives. I added details using white gel pen and Nuvo Moring Dew crystal drops. The sentiment is from Simon Says Stamp Thoughtful Messages stamp set. I white heat embossed the sentiment, hand cut the birthday sentiment and trimmed the smaller sentiment and adhered as shown. Thanks for stopping by my blog today. Come and play along the challenge. Gorgeous card Gayatri 🙂 the flowers are so pretty peeping out from the window, the whole design is stunning! Love this card! Thank you for sharing.